Greg Smith and Kouhyar Mostashfi are perhaps two of the strangest political bedfellows imaginable. Smith, a retired police chief and construction worker from rural southwest Ohio, is a devout evangelical Christian and ardent Trump supporter. Mostashfi, on the other hand, is an Iranian immigrant who works as a computer engineer in suburban Dayton and is an active member of the local Democratic Party. "A couple of months after the election, I was devastated because of the result," Mostashfi told "Nightline." "I was ready to cut every Republican friend and coworker and family out of my life because I believed that these people did not know what's best for this country." "I really believe in [Trump's] values," Smith said. "I really believe that he loves this country. He messes up but so do I. If I were president, I'd be just like him." And yet, these two men with seemingly irreconcilable differences became friends through a group called Better Angels, which brings Republicans, Democrats and independents together with the goal of depolarizing America. Political polarization or "tribalism" has reached a fever pitch in the U.S. Since 1994, partisan divides over political issues have increased from 15 percent to 32 percent, according to Pew Research Center. And it's not just polite disagreement. Nearly half of Republicans and Democrats see the opposing party as "a threat to the nation's well-being." In one study, about half of Republicans called Democrats "close-minded," "immoral" and "lazy" while Democrats referred to Republicans as "close-minded" and "dishonest." 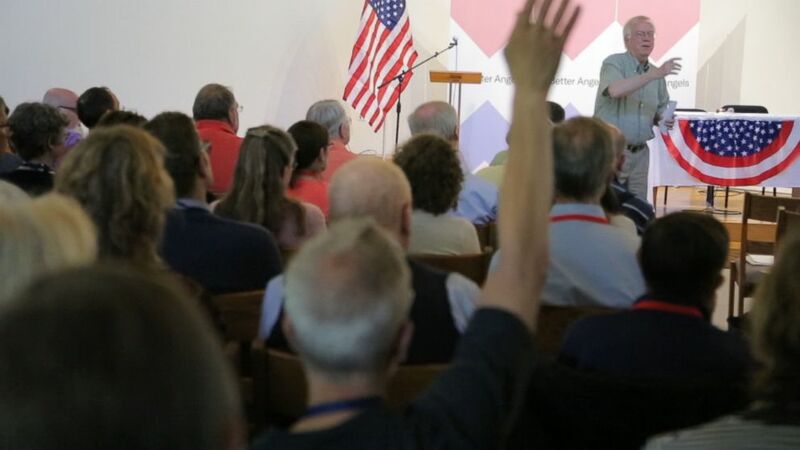 Better Angels held its first national convention in Harrisonburg, Virginia from June 6 - 8, 2018. 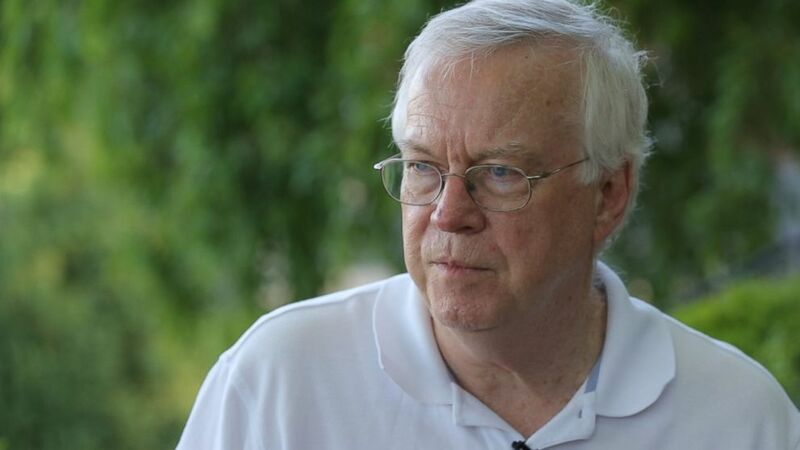 David Blankenhorn, the founder and president of Better Angels, said the "terrible tribal conflict" over every issue "prevents anything from happening." "Even before the 2016 election, it seemed clear this [conflict] was cancer," he told "Nightline." "And the 2016 election made it clear to everyone [that] we are in for a really bumpy ride." The group got its name from President Abraham Lincoln's first inaugural address. Delivered in the middle of the Civil War, Lincoln told his fellow Americans: "We are not enemies but friends" and appealed to the "better angels of our nature." That appeal for national unity resonated with Smith and Mostashfi when they met at their first Better Angels gathering. "When you get past the stereotype part of everything, you've got it beat," Smith said. "It was nice to also see this other side [and] that he wants to listen to me and learn about my background," Mostashfi said. Greg Smith and Kouhyar Mostashfi drove together from Ohio to Virginia to attend the first national convention of Better Angels. The two, whose friendship grew after they visited each other's place of worship, took a road trip together to attend the first ever Better Angels National Convention in Harrisonburg, Virginia. On the way, they hashed out weighty issues -- agreeing to disagree on abortion while finding common ground on guns. At the convention, Smith and Mostashfi met other political odd couples like Anthony Ginger, the president of the Young Democrats at Graceland University in Iowa, and his roommate Christian Sarabia, who runs the campus' Republican group. "We believe our opinions strongly but believe there are perspectives other than ours," Ginger said. "I think the first step is to evaluate yourself," Sarabia said. "You have to want to open yourself up to new ideas, new beliefs. Not to necessarily want to persuade the other person." Bill Doherty, a marriage counselor designed the group's strict format. One of the principle rules at Better Angels is that the goal of these meetings is not to persuade anyone to abandon their core beliefs. The group's strict format, which was put in place to keep things civil, was designed by Bill Doherty, a marriage counselor. "These are strangers and strangers from different tribes," Doherty told "Nightline." "And those tribes have been at war." In one Better Angels meeting that "Nightline" attended, Doherty led what he called a "fishbowl exercise." He had one group gather in the center of the room and the other observe from the outside. "You can't let people just go after each other. In the early phases of marital counseling, you do not let the couple talk to each other," Doherty said. "The idea was to create a process, a container, a structure in which there was little chance that people would get reacted to each other and escalate." In this particular exercise, Doherty asked the group in the middle -- in this case the "Blues" -- to discuss the balance between LGBT rights and religious freedoms and explain their side while the "Reds" observed and listened. Then the groups switched positions. "Very few of us get a chance to hear a group of like-minded people talk among themselves," Doherty said. "They're not arguing with anybody. They're talking calmly among themselves." It is a radical technique in a time when many people only learn about the opposing tribe through media caricature. "There's a strong feeling in the country of just being heartsick over this. Don't you feel this way? How are we going to survive as a robust free society if we continue down this path?" group founder Blankenhorn said. 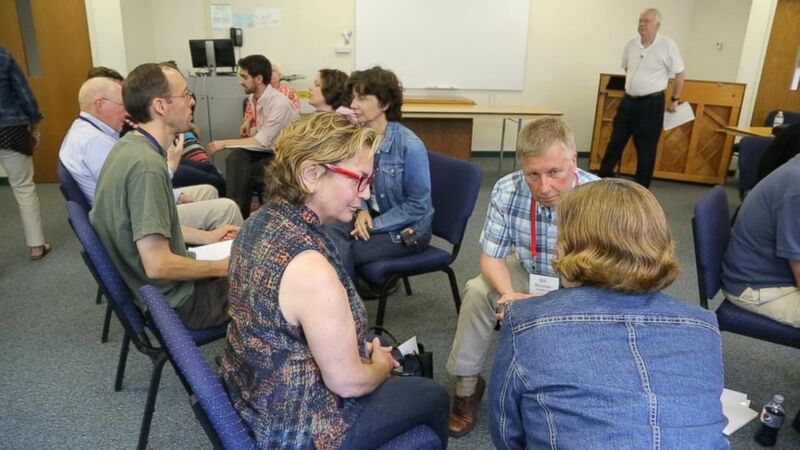 At the Better Angels convention, Bill Doherty had participants from different groups talk to each other in one-on-one meetings. After the fishbowl exercise, Doherty led a direct, one-on-one conversation between the two sides. The end goal was not to change minds, he said, but to reach an "accurate disagreement," which can lead to mutual understanding. "The end goal is humanizing one another despite our political differences," he said. "They have some reasons why they believe what they believe, that there's many thoughtful people on the other side, even though I disagree with them." Several of the participants said the exercises were worth doing. "Do I really feel comfortable sharing my views when right behind there are people who might not approve, who disapprove of them? I still feel a little inhibition," said Katherine Novikov, who sat in the "Red" circle. "But not enough to prevent me from speaking. All in all, putting the 'Blue' behind the 'Red,' they're there but you can't really see them. It's good." "People on both sides felt attacked," said Sheila Kloefkorn, who sat in the "Blue" circle. "Because they're such strongly held beliefs but I also think it's important to have a conversation. These are deeply held beliefs on both sides but we've got to talk about them, even if it feels hard." Other participants said they thought the exercise had created a new level of understanding for everyone. "If there's one thing we want to change, it's that the other is bad," Novikov said. "The other is terrible, terrible people. That part of their mind changes quite readily. Where they stand on policy is less important." For those who may want to try this at home, Doherty offered three tips. 1. Don't try to change people's minds. "If you enter into this -- and they sense your goal is -- to show them how stupid they are, with their perspective, they're going to put their defenses up. It's not a way to start," he said. 2. Make "I" statements, he said, rather than statements presented as facts. "For example, [say] 'I'm really concerned about climate change and what's going to happen to my grandchildren and great-grandchildren's generation, and I just feel like we have our heads in the sand about it.' As opposed to [saying], 'There's not going to maybe be a North American continent in 200 years.'" 3. Don't characterize the other side's opinion, just characterize your own. "So don't say, 'You guys want to just grow government and tax everybody so you can feed the trough of that,'" he said, as an example of something a "Red" may say to a "Blue." Blankenhorn, the founder of Better Angels, said the group was growing faster than he'd anticipated. In the 18 months since it started, the group says it has 3,100 members nationwide and is adding more. "It may seem a little naive to imagine that just citizens can band together in large enough numbers and with enough moral and intellectual firepower to cause a change in the national culture but I actually don't see a more efficient way to get this done," Blankenhorn said. "People are looking for ways to do this," he said. "The common thing people tell us: 'I have been waiting for something like this.'"